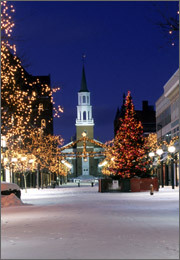 Burlington is the largest city in Vermont and the county seat of Chittenden County. Burlington also plays host to the Ethan Allen Homestead Museum, Echo Lake Aquarium & Science Center, Flynn Center for Performing Arts, and one of the oldest synagogues in the United States, Ohavi Zedek, which was constructed in 1885. Burlington is also where you’ll find many talented lawyers who take cases such as: green card, chapter 7 bankruptcy, personal injury, child custody, and DUI. Lawyers in Burlington are qualified to consult you on most legal issues and are also generally familiar with local court procedures. Stephen T. Aguilar and his criminal defense lawyers recently lost an appeal of his criminal conviction that they made in Burlington’s criminal court, asserting that his Fourth Amendment right with regard to search and seizure was violated by the DEA. In order to gather evidence against Mr. Aguilar, the DEA attached a GPS tracking device to his car without a search warrant to follow his movements as he drove around Burlington. Although this kind of search now needs a search warrant, the court ruled that the warrantless tracking of Mr. Aguilar’s car was still valid because this search happened before the Supreme Court of the United States ruled that a GPS tracking device search needs a warrant. If you are looking to file a lawsuit in Burlington, you are probably going to be filing with the Chittenden County Superior Court. This Court retains jurisdiction over tort, contract, real property, civil appeals, and small claims with a limit of $5,000. If you have a criminal case pending against you then you will probably end up in the Chittenden District Court. LegalMatch’s online services offers helpful research tools in conjunction to providing free paring service with Vermont bar certified Burlington lawyers. LegalMatch prescreens all their lawyers to assure you are matched with a capable lawyer for your case in Burlington. Research on your case can begin at the LegalMatch law library or in the Forums section. LegalMatch knows legal processes can be confusing and is able to assist you in the process, regardless of your particular legal issue.